Today’s guest blog is by Chris Egert, a reporter and anchor with KSTP 5 EYEWITNESS NEWS in Minneapolis/St. Paul. If you regularly read this blog, you know that there are some very hard working people behind the Snapshot Serengeti project. You know they have a great sense of purpose, and at times a great sense of humor. Both those qualities serve one well in Africa, where things run at their own pace. We are a television news crew who visited recently from Minneapolis, Minnesota. Turns out, we were the first media in the world to see the Snapshot Serengeti setup in person. That gave us some unique perspective of the human element that makes this operation run every day. What we are talking about is people like Ali Swanson. She regularly blogs on this site, and is one of the main engines that drives Snapshot Serengeti. You see her personality reflected on these pages from time to time as she talks about driving the hunk of junk Land Rover that is her office for half the year. But what you can’t get from a blog post is the energy this Ali brings the University of Minnesota’s Lion House. She drives around the wilderness all day servicing the hundreds of cameras you see on Snapshot Serengeti, then comes home after a long day, hangs up a punching bag, and proceeds to pummel it with kicks for 45 minutes. If Ali were in the United States, we would compare her to the Energizer Bunny, the character created by a battery company that keeps going, and going, and going. However, there aren’t any pink bunnies wandering around this desolate place, they’d likely be devoured by one of the wild animals that roam this land. Wild animals that often wander right up to the front porch of this research lab, with no regard for the humans who regularly occupy this structure. One morning as we walked outside to use the “bathroom” out behind the Lion House, there were several baboons running around. The boys from Minnesota promptly turned around and went back inside. Ali, fearless as usual, threw the door open and jaunted out to do her business. This is the same girl who drove 8 hours by herself in a Land Rover to their research lab near Seronera, while we took a 2-hour airplane ride. 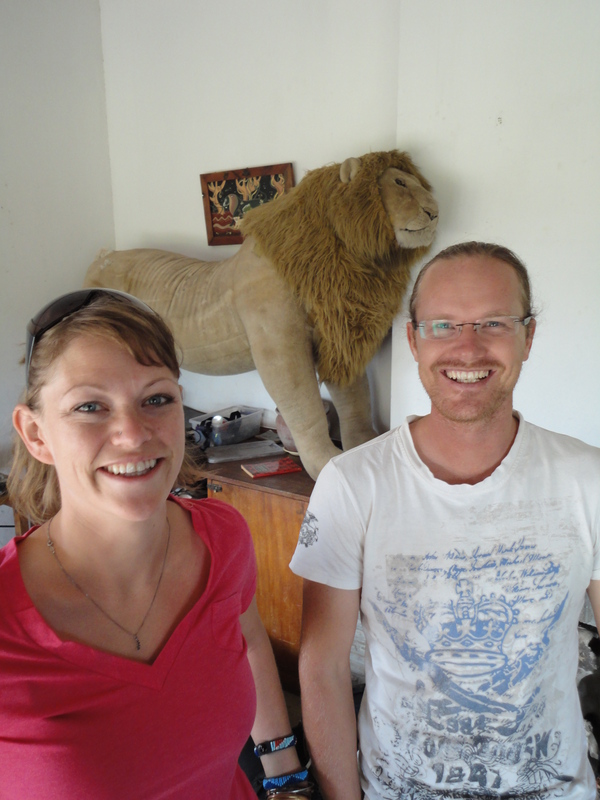 One thing we could provide for Ali, Daniel Rosengren, and Stanslaus Mwampeta, the regular residents of Lion House, was fresh supplies. We came bearing gifts of cheese and meat. Something they don’t get to eat very much around here. Up until we arrived, Daniel and Stan had been eating rice and canned green beans for the last several weeks. Daniel and Stan were overjoyed to have some real food. They were also very happy to cook for their guests. We planned on eating granola bars the whole time, but were pleasantly surprised to get a warm meal at the end of the day. Up until recently, the Lion House didn’t have a reliable fridge. They drink rainwater that is collected in huge tanks around the property. The water is boiled, filtered, and safe to consume. Although from time to time they say a dead monkey ends up in the tank, which as you can imagine is a real bummer. Sure, they are living a dream job, but it sure as heck isn’t easy. 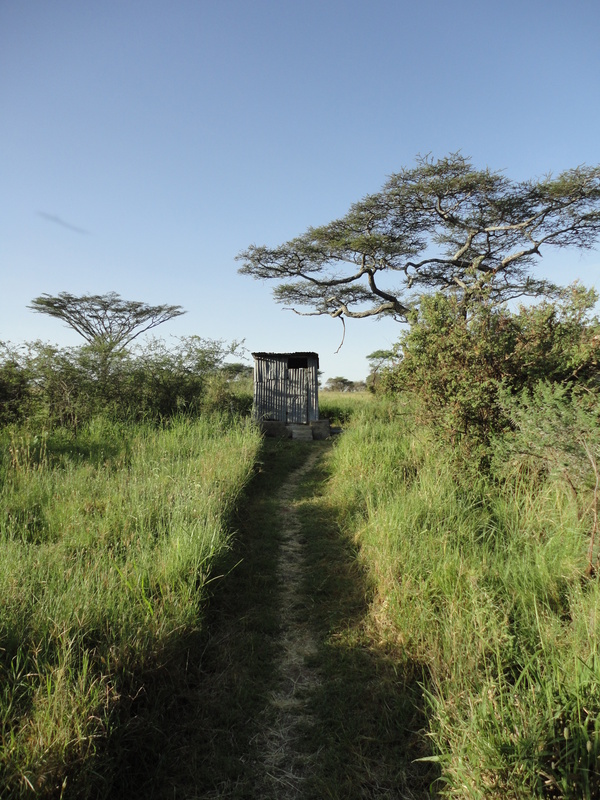 I will leave most the gory details out when it comes to the outhouse; except for one great bathroom related story that sums up how one survives in these parts. After a long day of traveling for Ali, she was eager to catch up with her friends, so we sat around, and talked, and laughed into the early morning hours. Daniel shared stories of his bicycle rides from his native Sweden to the southern tip of Africa. He told us about the time he was attacked with a machete, and rode in a bus for days just to find a doctor. Stan told us more about his native land of Tanzania. It is amazing to think that Stan is one of only a few people who live here who actually gets to see the wildlife. Lions, elephants, and giraffes are typically reserved for researchers and rich tourists, not the natives. Stan has a great smile, and he loves sweets. In the midst of this mind-bending mix of brainy conversation about ecology and how it relates to the Serengeti, someone had to use the facilities. That someone was me … and I won’t lie, I was terrified to walk to the outhouse at 1 am, a 100-yard trip where one regularly encounters wildlife. The coast was clear, so I went to head back, and race-walked to the lab. Then, as I rounded the corner, I saw it. The furry golden mane of a lion, feet from my face! Knowing well enough not to panic, I quickly shuffled back around the corner and caught my breath. Then it dawned on me that something was strange. 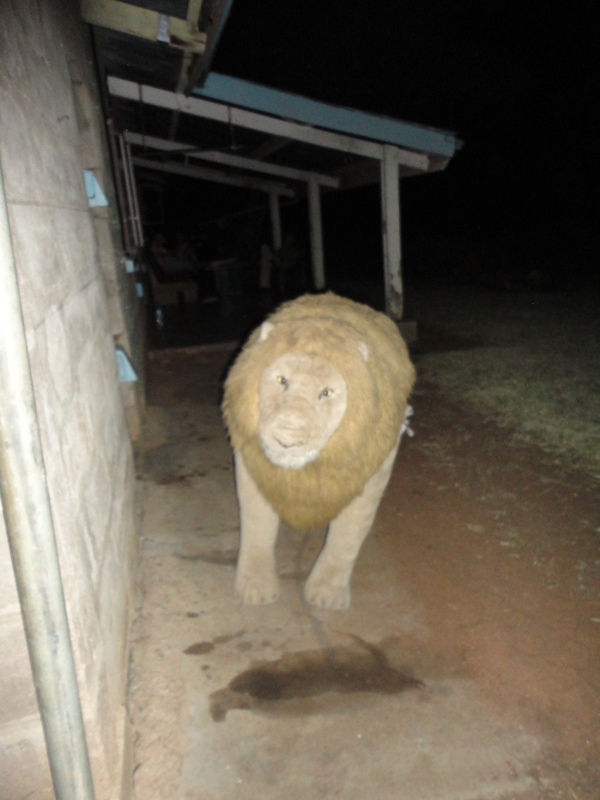 Flashlights typically reflect in the eyes of animals, but in the second I saw the lion, I don’t remember seeing a reflection. I peeked my head back around the corner at Simba, and realized that I’d been had. 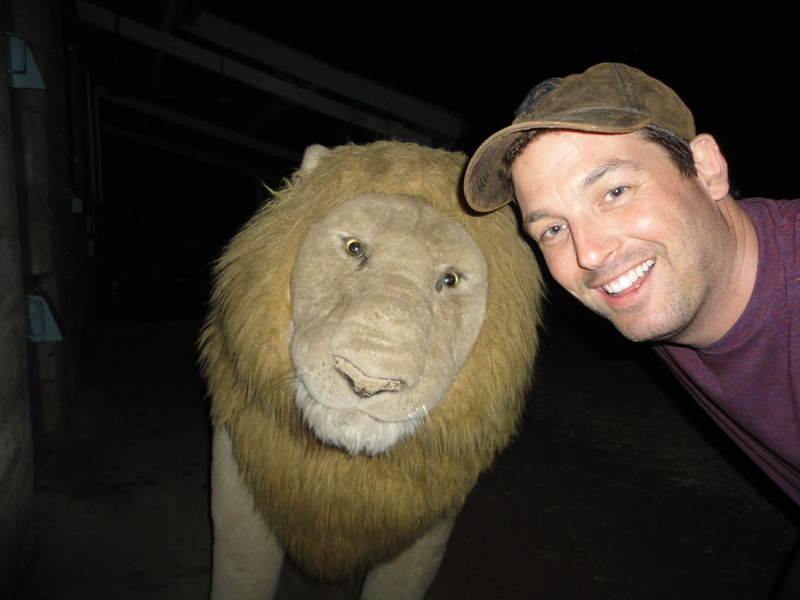 Daniel and Ali decided to give me a little Serengeti hazing by pulling a life-sized stuffed lion out of the house, and putting it in my path back from the outhouse. Vehicles break down. Hyenas eat your equipment. Monkeys break into your kitchen. Spitting cobras occasionally sneak into your sleeping quarters. And if you can’t laugh about it you won’t last long here… just ask anyone who has spent time on the Serengeti. Good post, Chris! You and your crew must have shot footage while you were there. Where can we see it? He’s airing a story this Monday at 10pm Central in Minneapolis/St. Paul. Hopefully it will be available online afterwards; I’ll let you know. Here’s a link to the story – turned out great!